First of all, a thank you to all who read this blog, which last month went above 100,000 hits per month for the first time. I know that’s still modest in web terms, but it’s gratifying that so many people are tuning in to read (or at least look at the pictures). So, while the dreams of sponsorship and expensive cars are still a ways off, nevertheless our heartfelt thanks to all our readers. The last two or three years have been, as readers with long memories will know, especially difficult. Redundancy, relocation and unemployment after finding myself working for Spawn Of Satan Ltd have all taken their toll. I would say that writing this blog has kept me sane, but my psychiatrist would beg to differ. Anyway, here’s to many more visitors to this site. And, of course, expensive cars. Speaking of the website, a curious phenomenon has arisen: I am getting junk mail. And not just any junk mail, but messages informing me that a selection of Russian prostitutes are waiting to, as they charmingly put it, “make me happy”. (I assume this means they’re going to do the ironing, unless something got lost in translation.) Now, In order for me to get an email through this website, someone has to overcome our spam filter – it’s a pretty common device, you have to physically verify you’re human by typing in a code which a machine can’t read. So someone has sat at their computer and filled in the form, setting out the happiness-making capabilities of Russian prostitutes. Let’s just think about this for a minute. This is a knitting blog, for heaven’s sake! Who do they think reads it? Has there been a sudden upsurge in gansey knitting among lonely young professionals? Is the Moray Firth Gansey Project really a human trafficking operation, luring vulnerable young girls to our shores with promises of high living and fine knitwear? (Answer: no, it’s not.) Let’s put it this way, I think the marketing plan and audience profiling of whoever is sending these emails needs serious work, and I’ve offered my services as a consultant if they’d like advice on how to target a more appropriate clientele. But back to the subject of the blog. Ganseys! I’ve reached the gussets, those wonderful diamond-shaped pouches that sit under the arms and increase movement for the wearer, as well as offering a bit more room around the chest, useful if you ever have the urge to go weightlifting in your gansey. They’re going to be about 4 inches long on this one, and are just under 3 inches now. I’ve been increasing at a rate of 2 stitches every 4 rows (my default rate for gussets) and it’s 19 stitches across so far. I’m making the increases on the stitch immediately inside the edge stitch of the gusset, which as you can see from the photos ensures a nice unbroken row along the edge on each side, and makes for a nice effect. 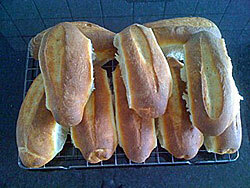 Finally, this week’s bread: Peter Reinhart’s recipe for cheesesteak rolls. Though in my case, being vegetarian, that would probably be “cheesequorn” rolls, which hasn’t got the same ring. Also, I’ve given up cheese, so the concept falls apart, rather. But they’re soft, made with milk and oil and an egg, and sweet, with a bit of added sugar, and whatever you want to put on them is fine with me! 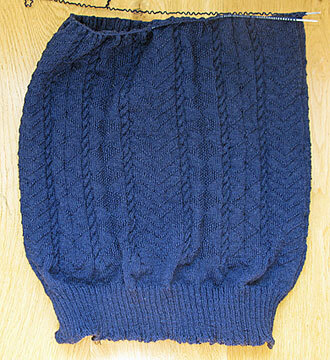 The gansey is looking very smart – is this a record time-frame for getting this close to finishing the body? Disgusting regarding the computer hacking (or phishing, or whatever name this invasion is given). It boggles my mind to try to envision what thrill this gives the dirty-deed-doer! 100,000 hits a month! Thank goodness all aren’t commenting on the blog! But I vant to make you happy! Leela: I’m going to remind him of his humanity, the way only a woman can. The Professor: You’re going to do his laundry? People, just be grateful I’m out there every day, protecting you from this filth. Even if I have to go and have a lie down every half hour or so. Your real name isn’t Tatiana from Kiev, by any chance..? Dear Gordon ! 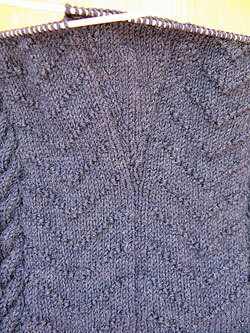 Many thanks for your knitting blog ! As to the junk – take it easy, that´s the best. I am a female with more children and grandchildren and still I get via e-mail instructions almost daily,concerning the strengthening of my manhood with blue pills, named Niagara :))! Junk filters are not very effective, so I am happy having a sophisticated computer with a Delete button ! Best regards and keep on knitting ! I can help with the expensive cars that you covet. I just found out that I “have won $1,900.000.00 (ONE MILLION NINE HUNDRED THOUSAND USD),in the BELGIUM CLASSIC LOTTO BONANZA Email Sweepstakes Program Corporation, held on the 27th of JUNE 2011 In Brussels Belgium.” While I don’t remember entering such a lotto, I’m sure that it must be legit, right? Just send me your banking information and I’ll forward it to the Lotto Commission. I think if there is one word that describes humanity down the ages is exploitation. Not to get to heavy here, but this is why communism and true democracy will never work. We just got this Exploitation gene (probably developed some time on the plains of Africa trying to survive) that keeps humans stuck in the mire. There is certainly evident in our collective historys where there is an exception to the rule, but then someone comes along and invents/discovers something really neat, and then that Spawn Of Satan Ltd comes in and has to make a buck (pound, euro, etc) or 20 or a million or a billion and is just not satisfied until the last drop of blood is squeezed from the Proverbial Turnip. I think there is a “King of the Mountain” gene also that plays into that somewhere, but scientific research is still ongoing. I think the Beatles at it right in the early 70s, Let It Be! Tell you what, why don’t you just send me the car direct, that way we can cut out a lot of annoying paperwork? Funnily enough, I’ve been in a Beatles mood recently, listening to the cds and even watching that timeless classic parody by some of the Monty Python team, “The Rutles”, which of course includes such timeless classics as “Sgt Rutter’s Only Darts Club Band”, “Yellow Submarine Sandwich”, “Shabby Road”, and “Tragical History Tour”. Apparently John Lennon enjoyed it so much he refused to give back the demo tape. I can almost forgive him “Imagine” for that!